My teaching hero, Kylene Beers, captured the very essence of my teaching life when she said the above. I think about this as I drive to school, as I plan my school days, and as I live my school days. I especially think about this at 7:30 each school day morning, when the doors to our school open and the footsteps of hope make its way up the stairway, into the hallways, and then my classroom. I hope that the plans I’ve made speak to what makes my kids curious, that what we read and talk about awakens their interest, and that they feel that each moment of their time in our room is worthy of their time. In their own way, my kids are thinking in terms of hope, too. They start the day hoping that kindness greets them, that they can count on patience and a sense humor to ease the way through the day, and that they are listened to just as much as they are asked to listen. Hope is what we’re all counting on…hope eases one day, and makes us look forward to the next. Teacher and student, we lean on hope…it’s what gives that “hello” its lilt and its smile. I celebrate that! This is a tall order, but Kylene and Bob, writing with their customary style which manages to be both scholarly and grounded in research as well as humorous, make their case in a systematic and compelling way. This kind of intentional, introspective responsiveness is something I need to teach towards much more than I presently do. “Why did this character/action/scene/problem/resolution make you feel this way and what does that say to you? How might this have changed your perspective about something in your own life?” will be the entry point to rich discussions, as well as build upon the notion that reading changes us. It led my sixth graders to look closely at sources, at the presence of extreme language and what we might be wise to read into that. and at the response it elicited. We were often surprised at the conclusions such reflections led us to – in other words, how it changed our perspective and made us more insightful readers, aware that all writers come to their task with biases we need to take into consideration, sources we need to question. I loved the fact that Kylene and Bob made note of the fact that responsibility takes stamina – if we care about the issues of the day, and as citizens we should, then we must cultivate this stamina. In a recent podcast about summer book lists I listened to, I was struck by the call for books that were empathetic – that called for the reader to bring the compassionate stance to his/her reading as a way of moving forward in an increasingly destabilized and uncertain world. This important work needs to begin in our classrooms, with our youngest readers. 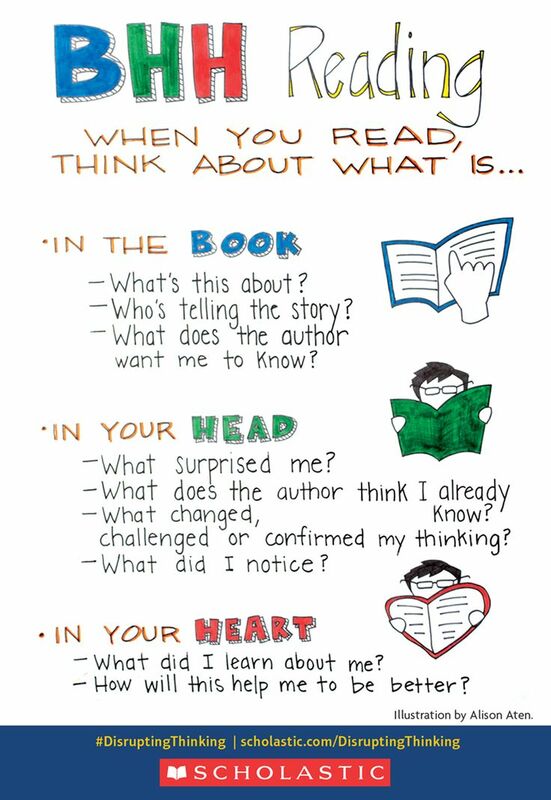 It was that last aspect that was a game changer in my classroom – the idea that we bring our hearts into our reading lives, we read to be changed and to grow as individuals. Disrupting Thinking was a fitting start to my summer PD adventures, and now that I’ve read it I want to keep the thinking it has inspired growing by participating in the FaceBook book group, as well as the Twitter chat Kyle and Bob will lead on #G2Great. Kylene Beers says don’t read it again, read it with new eyes – this year we started to learn how. The last Monday of the school year. By the side of my desk are stacks of Social Studies notebooks to scan one last time before I rubric them for content, completed assignments, and neatness – all the skills they will need in the years to come. As I leaf through our year of learning about American history, I am struck by the way our thinking morphed from the beginning of the year to the end – how it grew richer, more authentic, more student-centric. Like many other teachers, I have struggled with how to make the teaching of history engaging and meaningful, especially when it comes to the use of the text book. In our classroom, we learn history through projects, movies, and primary source documents. But, there is also the text book. We are lucky in that our text is Joy Hakim’s acclaimed The History of Us series, which is lively and well written. So, how to make use of this text in ways that are more interesting and meaningful to my students than just through dry guided questions and answers? Bit, by bit, first by modeling what such thinking looked like and sounded like, and then by talking through the differences we noted in how our thinking changed, and (most importantly) how the ideas in the text came to matter to us when we read through this lens, my students came to see the value in this new way of reading. By beginning with a “what surprised me?” stance, we prepared ourselves to be much more attentive and engaged than we would have been if we were simply going on a fact finding mission to answer specific questions. Diverging responses to this question opened avenues of rich discussion, and we were able to make much deeper connections between ideas in this way, too. What did the author think I already knew? really forced my kids to sift through the text to examine what the author presupposed of their background knowledge. Many times, we discovered that the reason we didn’t understand a concept fully was because the author thought we knew something we didn’t. Putting a great big ? next to passages like this allowed students to take ownership of their own comprehension process. For example, in reading about Abraham Lincoln’s life, the author writes that it was remarkable that Lincoln saw a city for the first time when he was 26 years old. My kids were surprised that this was a remarkable thing at all, until we asked: What did the author think I already knew? and realized that Hakim figured that her readers already knew that most people in Lincoln’s time and of his means did not travel far from where they were born, and many may never see a city in their entire lifetime. This led to a great discussion about the Industrial Revolution, and how societies and attitudes were changed forever as a result of advances in technology and communication. The third question, What changed or confirmed what I already knew? 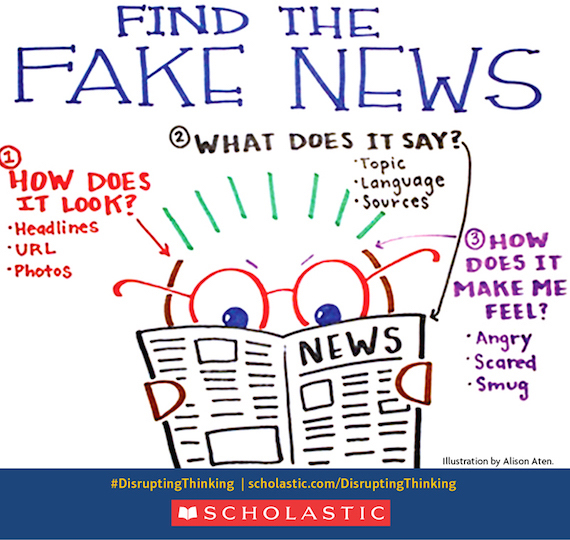 allowed us to sift through misconceptions, verify information, ask questions about why our thinking had shifted, or how we decide to weigh facts and opinions – whether our own or those of the author. At the end of our year of reading about history, as I parse through the notes my students have been taking, I can hear echos of all the discussions we’ve had as well. I know the work is not yet “done” – both my kiddos and I have much work ahead. For me, it will be in the company of a brand new class of sixth graders next year. And for my kids? Well, I hope that they have begun to learn to read in a way that makes the text matter to them. 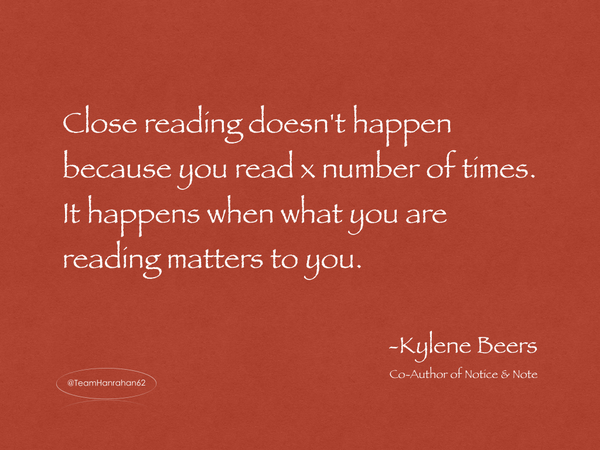 Kylene Beers says don’t read it again, read it with new eyes – this year we started to learn how.